Like many who enjoy overseas travel (and I’ve done my fair share while still having almost all of Asia, all of Africa, and all of South America still to see), I get excited for a new trip. I remember the days of first going to stay at L’Abri Fellowship in Switzerland. This was 2006, so before the iPhone was even a thing. I knew about where L’Abri was located up in the Alps. I also knew I had a certain budget. So I flew to Rome instead of Geneva, because it was cheaper and would also make me travel for a week after the term let out, instead of just going home like so many of my friends. Long story short, I flew to Rome, waited all day in Roma Centrale for my overnight train, fell asleep in the McDonalds for a while, met some interesting Spaniards and Italians on the train, and made it to L’Abri the next morning just in time to eat a quick breakfast and join in helping to clean the chalet. Now almost 11 years after that first solo overseas adventure, I’ve spent a total of two years in Switzerland, traveled to Mexico, Costa Rica, Canada, all over the States, spent a month or so in London, seen Paris three times, rock climbed by Mt Blanc in Chamonix France, and so much more. My family does Christmas in Costa Rica every year, and we’ve also done it in Northern California (near where I used to live in San Francisco) and Switzerland. I’ve also gone around the world while still building my online business that is my attempt at living a life of plenty and excitement, not a deferred life of hoping to travel once kids (of which we don’t have any yet) are grown and off to college or out on their own. On the plans for next year are another trip to France to climb and likely a trip to Africa for a wedding. Travel is amazing, but it had also changed so much over the last eleven years. I’m now 32, and the years between that first solo trip and now as I fly to Costa Rica again have changed the world in many fantastic ways, with the Internet connecting and democratizing information. Like many travelers, I have long enjoyed Vagabonding by Rolf Potts. His mantras of slow travel, minimalist existence, and sucking the marrow out of life (to quote one of my favorite movies, The Dead Poets Society) speak to my hippie tendencies, long haired living in the Alps smoking American Spirits and discussing philosophy and theology while drunk on cheap but delicious red wine. These tenets hold true across time. They started back likely before written history began and continue today, most often striking the college graduates and midlife crisis afflicted among us. Though others like myself and some of my entrepreneur friends simply want to see the world and not live a deferred life. I’ve learned the hard way to slow down and enjoy where I am. Maybe part of this is partially overcoming some of the social anxiety and self-consciousness I have always suffered from. I used to rush through places to get to the next so that I could try to see everything, or I’d avoid places because I felt like an outsider, like an American. When I look back at these times, I definitely remember The Louvre and British Museum, but what I remember most are nights at the pub (pro tip – a cheeky drink with British coworkers really means five pints on very little food then running to catch the last Tube and urinating in a random British person’s front yard at 1am. Just me?) or eating a picnic dinner along the Thames with family friends listening to live music after browsing the tables of used books set up under London Bridge. That’s what travel is all about. One of the biggest things that has changed over the last 11 years that I’ve been traveling (I just counted and I’ve done seven international trips in those years, spending a total of twenty seven or twenty eight weeks abroad in total) is the proliferation of Internet connectivity. I am a full time solo Internet entrepreneur. I have to have an internet connection to work, but I also Make sure to spend plenty of time seeing where I am located, and of course I take vacations as well. They’re harder as a solo entrepreneur with customers, but it is also entirely possible and I’m building towards the Tim Ferriss’s Four Hour Workweek dream a day at a time. But back to the Internet. During that first trip in 2006, I left on a Sunday and my parents didn’t hear from me for two days until I was at L’Abri and had access to the Internet that evening. Can you imagine that happening these days? As I’ve traveled the last few years, I have come to expect that every airport will have free wifi. And I’ve not been disappointed. The only one I can remember in recent memory that was impossible to reverse engineer access was Geneva, ironically. But Prague, Budapest, Tokyo, Puerto Vallarta, Amsterdam, San Jose Costa Rica, Paris, you name it and they have a strong wifi signal. Because we all have smartphones these days (except for those flip phone hipsters, but they don’t count), it’s never been easier to discover amazing places to go. And not just the typical sights, but you can discover amazing off the beaten path restaurants, surf spots, and more with a little digging through the travel diaries of the Internet. If you use it right, your smartphone can streamline your travels so that you never again wonder where your hotel is located, where the nearest train station is, or how much a souvenir actually costs (because you have a calculator!). Google Maps has enabled us to navigate so much easier, even internationally without a data plan or local SIM card (I actually prefer to not buy a local SIM so that I am forced to be present where I am, not on my phone) as that magical little blue GPS-enabled dot shows you where you are. With offline maps you can even get driving directions. 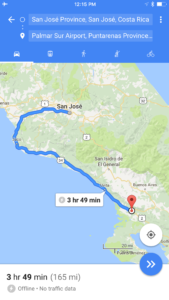 Here are directions for driving south in Costa Rica. I did this while still on the plane. If you travel then you likely use your phone camera to take photos of places you are visiting so as to remember them later. Take a photo of your room number when you leave so that you do not forget your room number. Whenever I go on business trips I always do this, because after a while all the rooms run together and after a few drinks one can become quite forgetful. Take screenshots of your mobile boarding pass before you go offline. If for some weird reason the airport does not have a wifi connection for you to use, you will still be able to access your mobile boarding pass this way. Screenshot booking confirmation emails and important itinerary information. Keep these with you as well as emailed to a trusted friend or family member back at home, just in case. If you do multi-city itineraries or simply travel often, Tripit can be your best friend for storing travel information so that you never have to search through your email frantically at the last minute wondering when your flight leaves. Their reminders three days out have saved me a few times from heading to the airport on the wrong day. Everything we need is right there, including confirmation numbers and addresses of hotels and such. Tripit is free to use (though also had a premium plan). 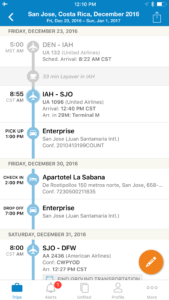 Once you are signed up, you can forward confirmations for flights and accommodation (or others like restaurant confirmations) to plans@tripit.com and they will automagically be added to your itinerary and app. Sync the app before you go offline, and boom. Note: this post contains affiliate links, meaning if you click on one and buy it I’ll receive a small commission. But I never affiliate link anything I haven’t personally used/read and personally vouch for. Great post John. Tripit is awesome, it automatically creates complete travel itineraries from your email confirmation notices. Includes maps of destinations and airport terminals etc… the only downside is that the ads in the free version are annoying! I don’t use it very often so I don’t want to purchase the paid version.